6.1 Introductory Information 1- Treatment or therapy is the preferred word by those who work one on one with individual client, families or small groups, but stress management refers to programs for people in general, less often for special groups characterized by some shared problem (Lazarus & Folkman, 1984, p.334). 2- Coping is the process of managing demands (external or internal) that are appraised as taxing or exceeding the resources of the person. 3- Coping consists of efforts, both action–oriented and intrapsychic to manage (master, tolerate, reduce, minimize) environmental and internal demands and conflicts among them. 4- Coping is a series of transactions between a person who has a set of resources, values, and commitments as well as a particular environment with its own resources, demands and constraints. Thus, coping is not a one time action that someone takes, rather, it is a set of responses, occurring over time, by which the environment and the person influence each other (Through: Taylor, 1999, p.204-205). Figure 6.1 illustrates the coping process. 5- Effective stress management has clear health benefits in controlling stress-related disorders. 6- Stress management programs have been used successfully to treat muscle contraction headaches, to manage migraine headaches, to control high blood pressure, to treat alcohol abuse and obesity, to train individuals with symptom of cardiovascular disease or myocardial infraction (Ibid., 230-231). 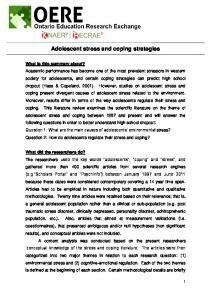 7- Individual coping strategies are ways of coping with stress that has already occurred. (Luthans, 1992, p.413). 8- Group programs may be useful when coping failure is due to an uncomplicated lack of knowledge, skill or experience (Lazarus & Falkman, 1984, p.363). 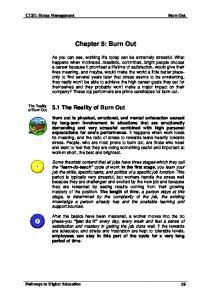 9- More commonly, stress management is taught through workshops (Taylor, 1999, p.230). The stressful event, its stage, and anticipated future course. one worry or crisis is occurring at the same time, your mental and physical energy has to be diverted to handle all of the crisis situations. This means that you have less energy available to handle each individual crisis. The less energy you can supply to an organ or muscle group, the faster it will fatigue, and the less able it is to respond to stress. Eventually, your body’s “first-choice” organ group will become exhausted and ultimately damaged. If the stressful situation is still present, your body will switch the coping responsibility to another organ or muscle group. That’s why some people get a skin rash after they get asthma or develop low back pain after they get an ulcer. If the stressful situation is still not resolved, eventually the second organ or muscle group will become exhausted and your body will shift the coping responsibility to a third organ group and on and on. h) Avoid unnecessarily provoking situations where possible i) Avoid over committing yourself “learn when to say “no” without feeling guilty j) Avoid fragmentation which is often caused by trying to do several things at one time k) Know how to avoid causing stress to others l) Be aware of unnecessary worrying m) Anticipate stress and plan your response to it. 10) Learn the value of positive thinking. 11) Discover how effective a cheerful outlook can be. 12) Be, as sure as you can be, of what your motives really are and make sure that you are really happy with them. 13) Acquire the habit of sorting your priorities. 14) Learn the art of effective delegation. 15) Get into the habit of talking problems through rather that bottling them up. 16) Don’t forget that listening is as important as talking in effective communication. 17) Learn to value physical fitness as a means to realization and antidote to stress, and do all you can to acquire it (Cranwell –Ward, 1987, pp.121-122; Dore 1990, pp. 13-14). 18) Develop a sense of quiet and engineer your environment. 19) Keep your work and private life separate. 20) Build a satisfying family life. 21) Do what you enjoy and enjoy what you do. 22) Manage your time. 23) Take time away from work. (GUPCO, 1999). 6.4 Specific Techniques for Stress Management There are many techniques for stress management that we can put under the title of a cognitive behavior therapy. They include: 1) Relaxation training. 2) Social skills training. 3) Assertiveness training. 4) Good health habits education. 5) Social support providing. 6) Self monitoring. 7) The modification of internal dialogues. 8) Goal setting. 9) Homework assignments. 10) Positive self-talk. 11) Self-instruction. 12) Contingency contracting. 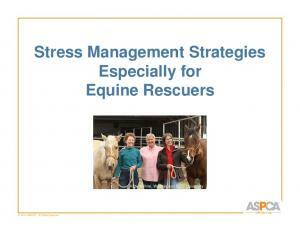 13) Stress inoculation training. 14) Behavioral self control. 15) Training in supplementary skills (Time management). (See : Ibraheem, 1994; El-Mohareb, 1420, Leahy, 1997). Job design and job description. Group dynamics in work place. Management of conflict and clarifying of organizational roles. Good communication skills. Good leadership styles. Effective political strategies. Organization processes. Decision making skills. Organization development techniques. Supportive organizational climate. Planning and developing careers. Receiving feedback. Resilience. Good physical environment at work. 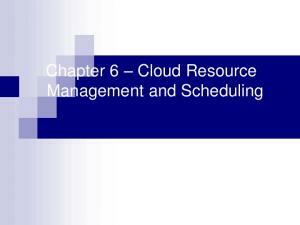 Report "Chapter 6: Stress Management Strategies"